I just discovered this tool after a half century of life! Don't wait to find these writing tools! I had just vacuumed my side of the bedroom; and now I was on my hands and knees picking up the debris left behind on the carpet, piece by piece. As a perfectionist, I could not rest until it looked like every carpet I ever saw — totally clear of debris. I remember wondering how people vacuum a whole house and vowed I would never have carpet when I grew up! How was I supposed to know we had a cheap vacuum cleaner! When I first began gardening as an adult, I ran into the same problem — tool ignorance! 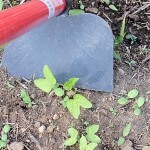 I was hand weeding daily. Now I know better! Tools save time! A writing tool works the same way! Tools make our lives manageable. If you're frustrated with some aspect of your business life, chances are you are afflicted with tool ignorance! That's not an insult! That's just the state we are all in when we're frustrated with something we're trying to do, and just before we learn about the tool that makes it possible. You may be a beginning writer, or you're a business person and you don't consider yourself a writer. In fact, you may be thinking of outsourcing your content writing at the point of frustration. But before you give up, hear me out. I strongly believe that everyone can write. Now everyone can't write the great American novel, or a long technical piece. But anyone who talks can write what's on his or her mind. So why not try a few simple active tools for getting your thoughts down before giving up? Don't let the word "dump" scare you away! I use it because this part of the process is messy. It might even be ghastly! But it's the only way I know to help you sort everything. When you can't find something in a briefcase or purse, you sometimes have to dump it all on the table. When I begin a writing project, my brain may be all jumbled up. When I dump my thoughts out, I can sort out the trash and pick out the gold! What you want to do at this stage is get it all out of your brain and onto paper or into your word processing program. My best process is still with pad and pen. Use your most comfortable format. If you have a struggle with beginning, use the talk tool. Say what you want to write. Either talk into a recorder or call someone and talk to a person and record it. That gets the thoughts flowing. Now you'll be ready to just go ahead and dump it out in written form. Just write it all down and don't worry about the order or whether it makes sense to someone else. Best way to do the dump is to set a timer for 5 minutes and 1, 2, 3 GO! Don't stop writing, even if you just write one word over and over until another thought comes. Repeat the process as often as necessary. Cross out anything that is just plain yucky! Highlight thoughts that sound good as is. Underline in green what will need to be cited. Underline in red when you need to confirm the wording or source of a quote. Put a star near a very important thought and a question mark if you're still not sure how to explain it. Use a different colored extra fine pen to make little notes as new thoughts come to mind, and make arrows to connect thoughts together. Begin to put everything in order in writing, leaving blank spaces for citations and quotes. Read out loud and check for readability with pen in hand! That's all there is to it really. Read it out loud and mark anything that sounds awkward. Make changes on your piece. When you think it's ready for "other person consumption," ask someone you trust to read it out loud for your ears. Find all those places that just don't seem to make sense and fix them. Work on them one at a time. Look for things like the same word used twice in a sentence or paragraph. Use a thesaurus if necessary. Now put your editor/proof-reader hat on, or hire one! Pay attention to anything with green or red squiggly lines in your word processing program! But keep in mind that does not catch everything! For example, think of words that sound alike but are spelled differently. Spell checker won't get those. Some examples include: due – do; two- too- to; see – sea. Grammar check won't catch stylistic blunders. You have to hear those. So if something just doesn't sound right, work on it. Grammar check also will catch things you want to leave as is. For example, sometimes a sentence fragment works for emphasis. Notice that I saved grammar and spelling for last! That's because they are the least important aspects of writing. However, if you don't catch them, it distracts the reader and takes away from what you are trying to say. There is more to writing online. For example there's SEO (search engine optimization) and various writing formats, among other things. But those are topics for other posts. If you need help at any point in the process, remember I'm here. I can answer your questions below, or I can edit or write for you.